We're excited to announce a new feature on the Infusion Community of Practice (CoP). The Arts Integration in Action blog will feature stories from artists and educators who are sharing their own thoughts and experiences about how they are working to enhance learning in and through the arts. You can read these posts in the main blog feed on the CoP homepage, or by clicking the Arts Integration in Action tab in the red navigation bar. Our first guest blog comes to us from artist Kiki van der Heiden who, along with writer Alison Gear, is working with over 70 Haida Gwaii students on a project called Taan's Moons. Students are engaged in language arts activities like felt board stories, memory card games, and writing exercises, as well as math exercises, movement, drama and many felting and drawing activities. 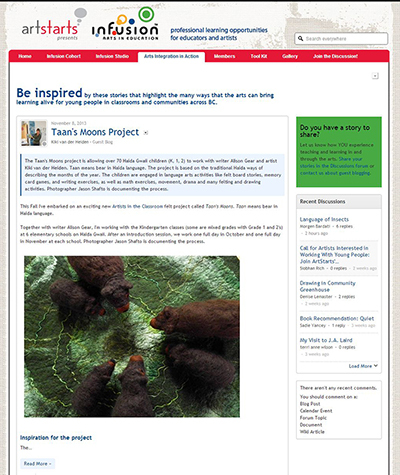 Read about the Taan's Moons project as it unfolds on the Arts Integration in Action blog. Feel free to leave a comment with your thoughts or questions for Kiki! Stay tuned to the Arts Integration in Action blog for more stories from guest bloggers.